​NEW: Thanks to the Growth through Ministry effort and the generosity of parishioners who contributed, there are NO FEES for Gathered By Grace this year! Gathered By Grace: Children ages 4-5 years old (rising preschool and kindergarten) are invited to participate in a small group during the All Ages Sundays. Children will love the innovative early childhood curriculum, Pflaum Gospel Weeklies. Children are invited to seek a relationship with God while reinforcing a strong sense of community and love. Children will become familiar with the Catholic sacraments, liturgical rituals, symbols and seasons. Registration is required. NO FEES this year! 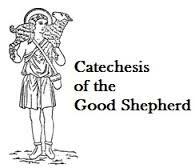 Catechesis of the Good Shepherd: Catechesis of the Good Shepherd is a Montessori-based faith formation program developed by Sofia Cavaletti for children ages 3 to 12. OLMC will soon be offering Level I (3-6) as an additional option for OLMC families. Adult volunteers are required to complete the Volunteer Background Screening Form, Safety Environment Regulations Acknowledgement Form and attend the VIRTUS Safe Environment Training.